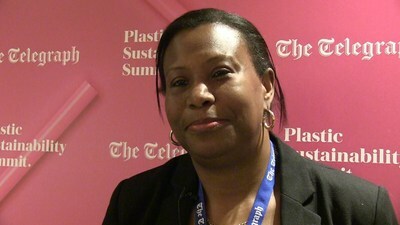 LONDON, March 22, 2019 /PRNewswire/ -- Despite being at the forefront of climate change, having been faced with the aftermath of Hurricane Maria and Storm Erika a few years ago, Dominica sends a powerful resilience message during the Plastic Sustainability Summit held on Thursday in London. Organised by British newspaper The Telegraph, this first of its kind event was attended by heavyweight names and brands with an interest in sustainable solutions involving plastic use. Though panel discussions concerned largely the British market, several speakers highlighted that dealing with plastic sustainability in the wider context was the way forward. Sian Sutherland, co-founder of campaign group A Plastic Planet, made a striking remark regarding the importance of focusing on the entire lifecycle of a plastic product: "If it's never being recycled, it's all single-use plastic." Joe Franses, Sustainability Vice President at Coca-Cola European Partners, agreed that refillable packaging and deposit return schemes could be a medium-term solution, advising businesses to "make it easy for consumers" to participate. The small Caribbean island of Dominica was mentioned during the summit in terms of implementing more green initiatives than larger economies, such as its recent single-use plastic ban and sustainability ethos reflected in its key economic sectors. The acting High Commissioner of Dominica to the UK, Janet Charles, attended the event and explained during an interview for Truly Belong magazine why Dominica was able to implement green initiatives faster than the vast majority of the world. As regards the comprehensive plastic ban that came into force on January 1st this year in Dominica, she noted that the government and the population did not encounter any difficulties. "There were public awareness programmes and training (…) and the government did a fantastic job of taking the steps to enforce the ban," she clarifies. "In Dominica, we have been recycling since I remember myself (…) It is for our future." Quoting the eminent pledge made by Prime Minister Roosevelt Skerrit for Dominica to become "the world's first climate resilient nation", Mrs Charles concluded that Dominica contributes among the least to climate change, despite it being "at the frontline and [feeling] the effects of climate change" first-hand. Besides the plastic ban, Dominica is hailed for its thriving ecotourism industry; building new, hurricane-proof public housing; and working towards providing its entire population with clean energy by investing in a geothermal plant. All of these green initiatives are sponsored either partly or fully by the country's Citizenship by Investment Programme, considered the most reputable in the world, according to Financial Times experts. Dominica carefully selects foreign investors it wishes to join them as economic citizens, who then make a financial contribution to the Economic Diversification Fund or an investment in pre-approved real estate that supports the tourist sector. The latter includes eco-luxury villas and environmentally conscious hotels such as Secret Bay, Jungle Bay, Marriot's Anichi Resort, Kempinski's Cabrits Resort, Hilton's Tranquility Beach and others.